It's time for Digimon Adventure tri. Part 5 Coexistence after a short wait! 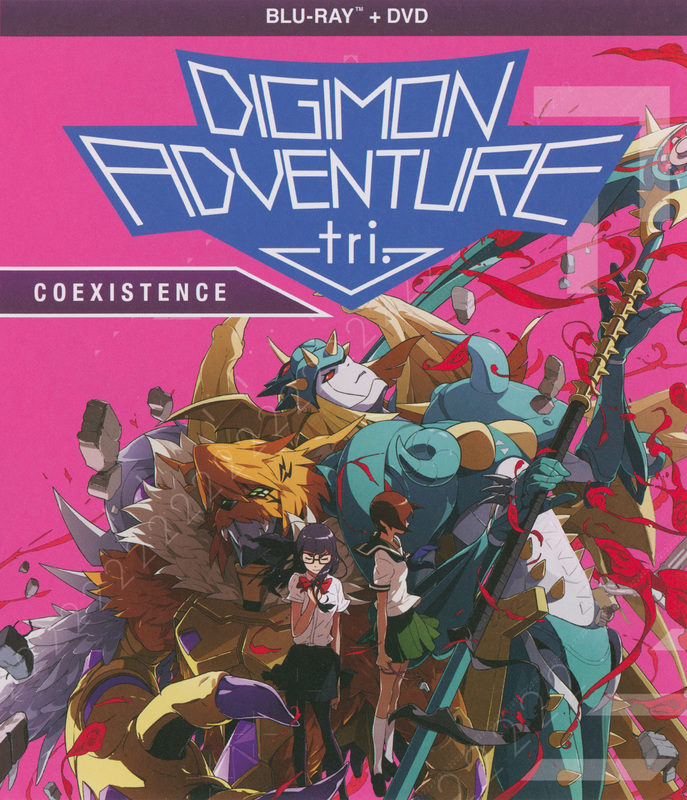 It's been a few months since Part 5 had it's theatrical release (and Part 4 came out on home video) and it's time for the penultimate part of tri. in the US. We're just about 2 weeks until the general release, and anyone who pre-ordered from Shout should either have it, or it should be on the way. Very little scanning and editing on the scans in this one, things simply went smoothly. There may be spoilers for Part 5 given below, just a small warning. First, a short jump into the story. 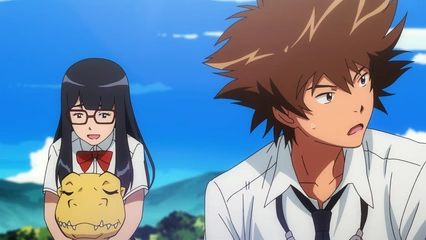 Digimon Adventure tri. 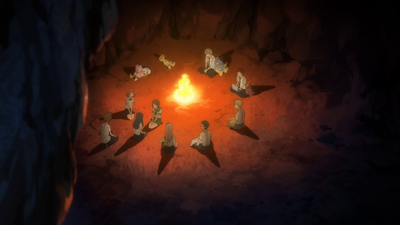 Part 5 - Coexistence picks up immediately after the end of Part 4.
tri. Part 5 actually begins with the ending of Part 4, which isn't a bad idea considering the dramatic cliffhanger. A bit more surprising is that after that, we get a number of scene jumps for a decent chunk of time that act as expanded exposition. 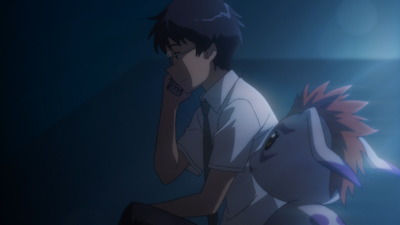 We get a Meicoomon/Meiko flashback, then a jump back to directly after the cliffhanger. 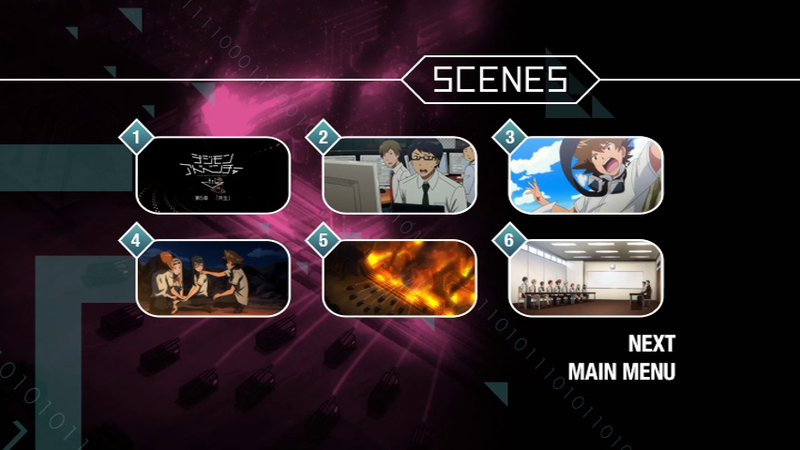 After this scenes continue to change showing us updates and information about what is going on elsewhere. The exposition/info dump works shocking well though, to the degree that I haven't thought about it heavily until I was jumping around checking things. WtW Podcast Episode 19, AR, May, and myself discuss tri. Part 5 after it came out in Japan in quite a bit of detail. WtW Podcast Episode 33, After seeing the dub in theaters AR and I discuss our thoughts on the dub. To say a bit more though, I like Part 5, but I also understand why it seems to be one of the more contentious parts. It begins on a very active cliffhanger from Part 4, while spending quite a bit of time setting up things for the finale of Part 6. Moreso than other parts, it feels like it doesn't quite have a solid beginning or ending, because of how deeply it ties into the overall whole. The English dub of tri. Part 5 has a few issue. The cast returns for Part 5, which is expected. By now most elements of the dub have settled in, and there isn't to much to comment about, minus that everyone puts in a great performance again. There are a handful of haphazard moments in the tri. Part 5 dub though, two of which come to mind while I write. The bigger issue is Tai's speech towards the end. Watching it in theaters it felt like a completely incomprehensible mess. It was poorly written, and muddled up a key moment during the climax. Rewatching that scene on home video... it seemed less cluttered, even if it still isn't elegant. Whether that's because I've softened to the dialogue, or they re-edited it after the theatrical screening I don't know. I expect I'll rewatch that scene a few more times to get a better handle on it, but it at least seems better than I remember, which is a good thing. 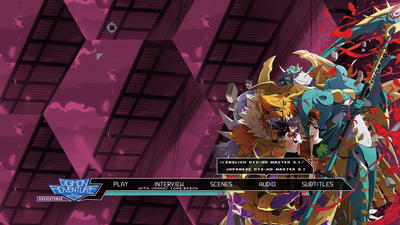 The ending credits are shorter than the version on the Japanese disk. 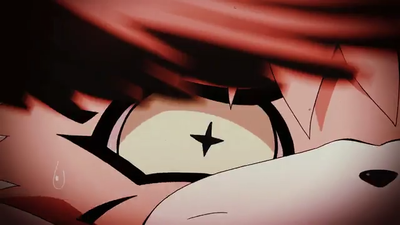 The actual ED footage in a window box is the same as on the Japanese version, but the credits have been shortened and a shorter version of the ED theme is used so that all 3 elements end at roughly the same time. The logo used in film is the Japanese logo. 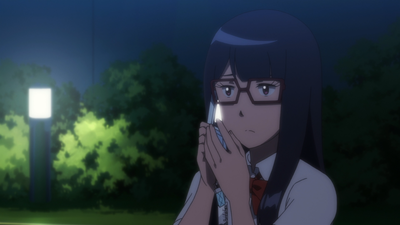 Any screencaps from the Blu-ray, DVD, or digital copies are lossless PNGs. Most images in the article are smaller copies from our gallery (to keep loading sizes smaller for everyone), but link to the full sized versions when clicked. Scanning was done at a high quality, and compressed and shrunk to reasonable sizes, along with reasonable quality JPG compression. I've explained my workflow in my personal thread and will answer any questions involving it or the processes used. First up will be the physical stuff. 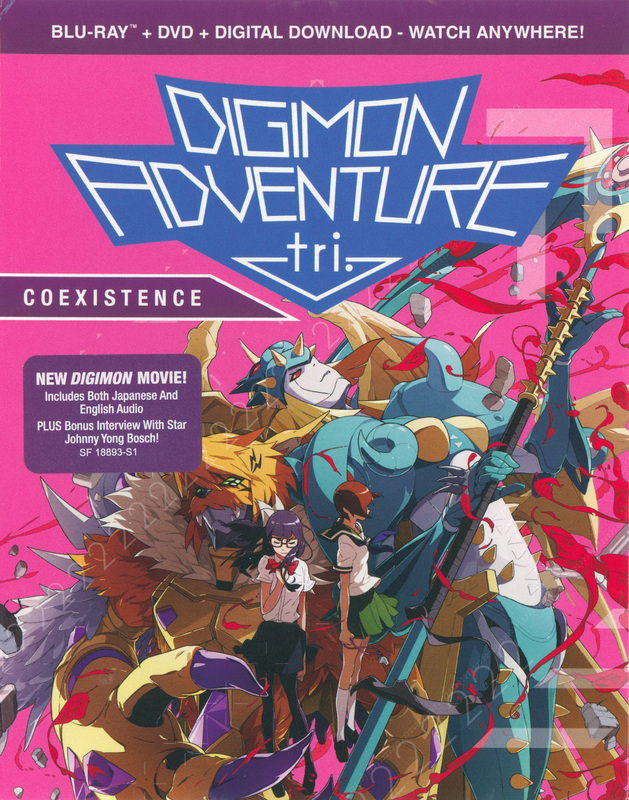 The front cover uses the well known theatrical poster art for tri. Part 5. 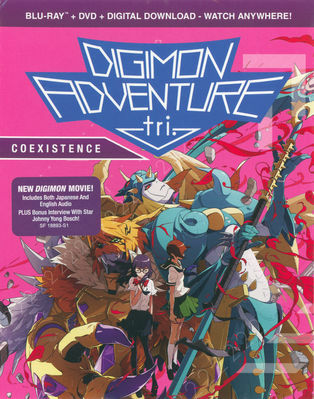 The logo is the English version of the tri. logo with blue backing so that the text is easier to read. They've also added a small 'slide' to the left of the bottom part of the logo in a purple color with the title of Part 5, Coexistence. The top has a purple colored bar listing Blu-ray and DVD. This being probably the best known part of artwork specific to Part 5, it makes sense to use. The logo placement works decently well, but the position does mean the bottom chunk of the image has been lopped off, leaving the overall layout of the art itself feeling a bit less open than it did on the Japanese poster. 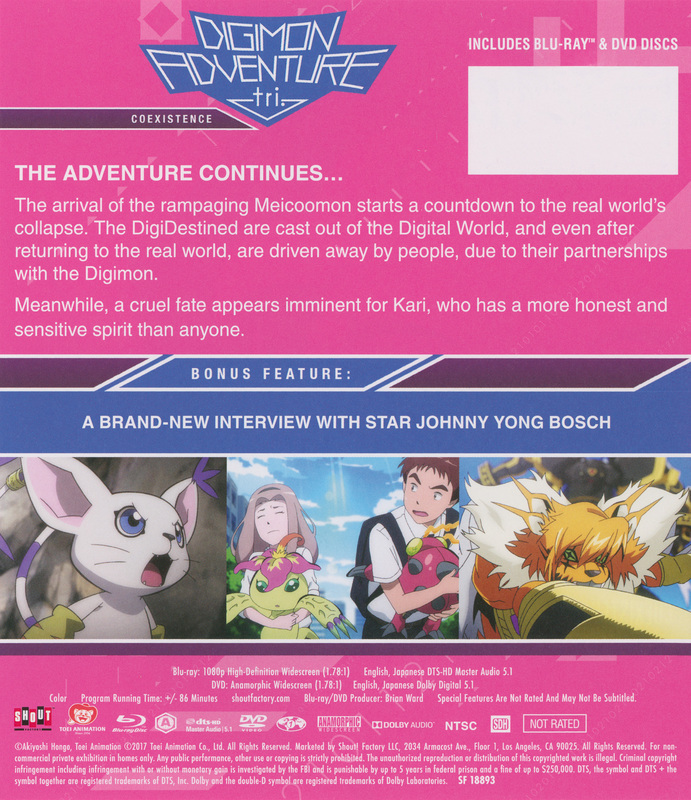 The back cover has a general plot description for Part 5. Nothing major to mention here, as the choices for overall layout works well and there are no oddities at a glance. They also tell us the extra. We also get a few cropped screenshots, along with a full list of product specs and info at the bottom. The UPC code was partially clipped out, so I've removed the rest of it. Because I could scan it flat since the entire thing was an insert, we also have the spine of the insert. This uses the English 'straight' tri. logo version nicely, combining the pink and purple motif the packaging goes with in a way that looks quite clean. The Blu-ray comes with a slipcover (in an o-card shape) that is made out a nice cardstock. The slipcover front, back, and side are all reasonably the same as the main insert. The main changes are the mention of the digital copy on the front and back. I assume once the digital copy is no longer offered, Shout will simply will stop including the slipcover, and they won't have to revise the packaging any further. 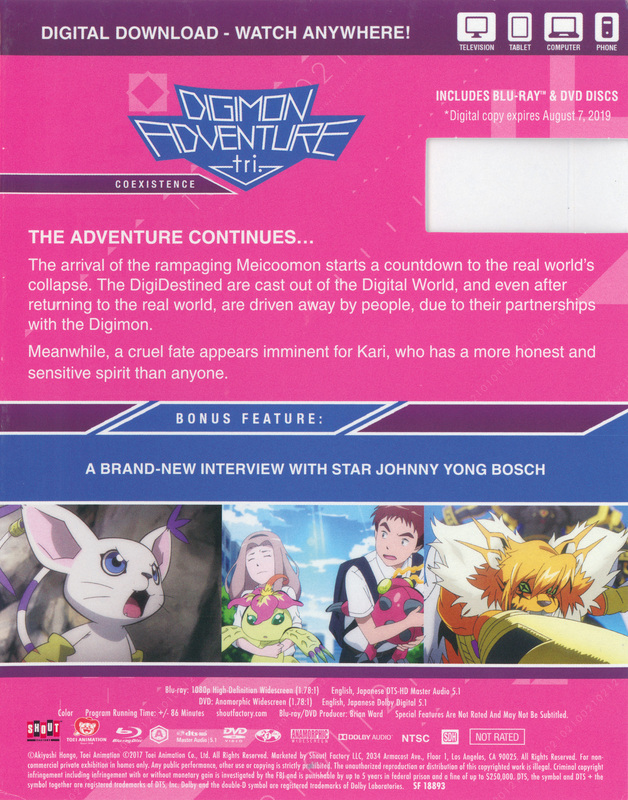 The front has a sticker on it mentioning tri. Part 5 being new, it having both audio tracks, along with a mention of the special feature. The back has a square cut out of it so the UPC is visible through the slipcover. 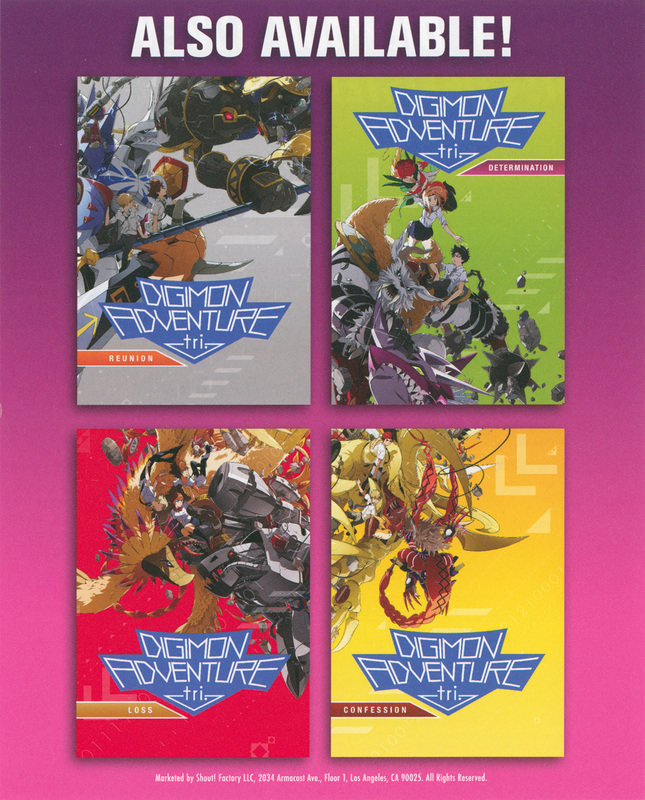 The spines on both sides were identical to those on the insert, and since the insert scan was simply better than I could have gotten on the spine of the slipcover, it didn't seem worth scanning those. 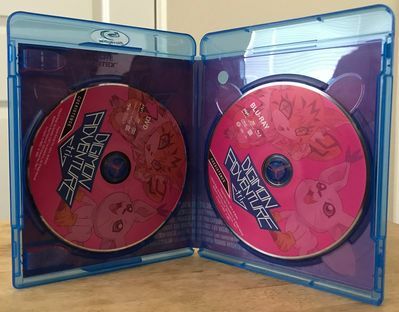 The Blu-ray case itself is a relatively standard Blu-ray case, which means that it isn't just colored blue, it's also see thru. 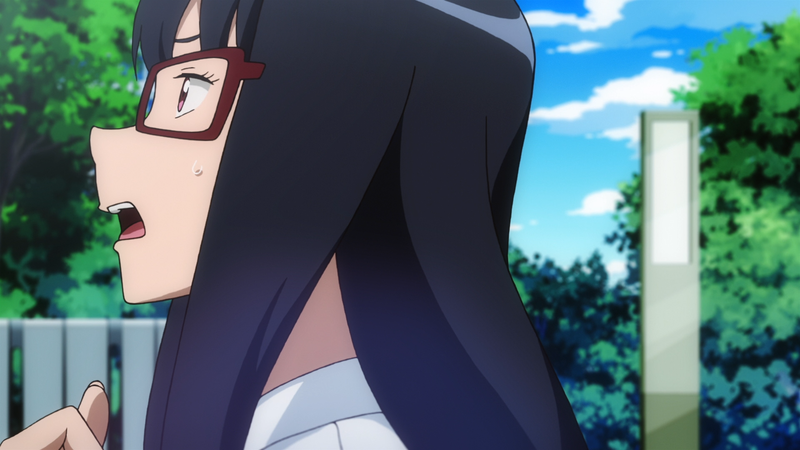 Although interestingly, it's a different style of case than previous tri. release from Shout. This doesn't really change anything, but the case looks nicer. 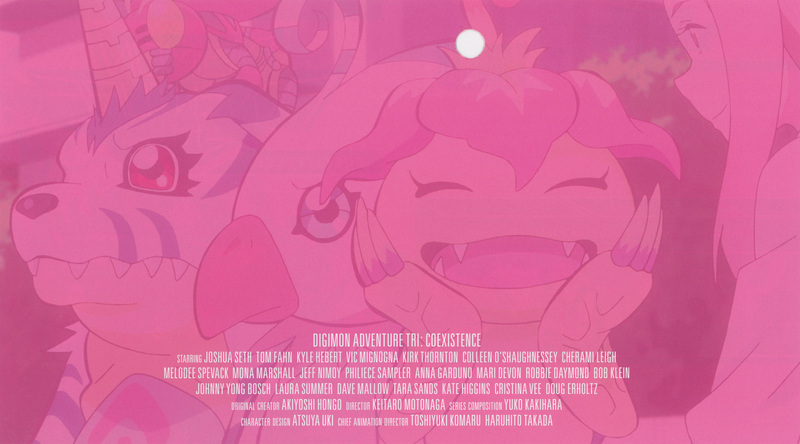 This time the other side of the insert is a shot of some of the Digimon and Mimi with a pink tinge to it. The image fits well in the space, and the credits are laid out well. I like what they used, but it feels like maybe something with Kari or Meiko to match Part 5 itself might have worked better. The clipped out portion can be seen here. I will try and swap it out when my retail copy arrives. 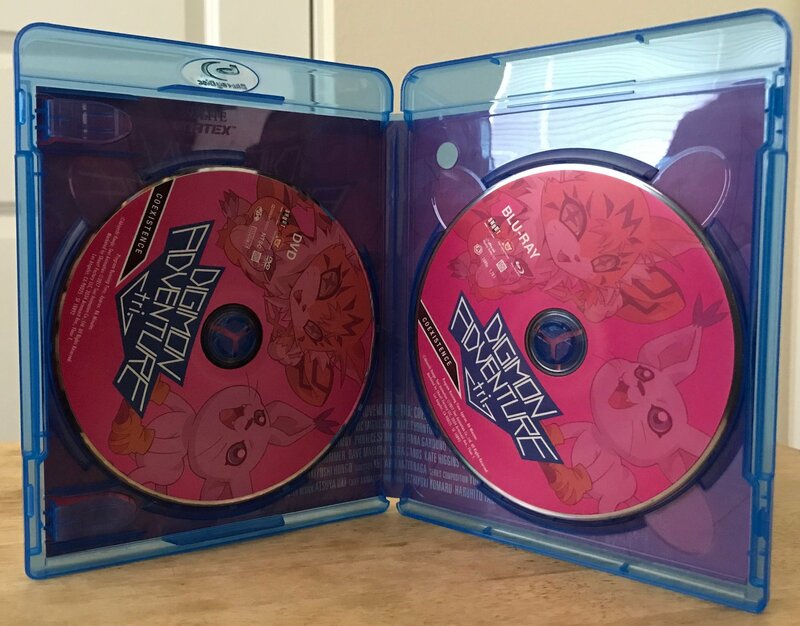 The physical Blu-ray and DVD continue the usage of pink. They look nice with just character art of Meicoomon and Gatomon this time around along with the pink motif. The coloring on the Blu-ray appears slightly more vivid. 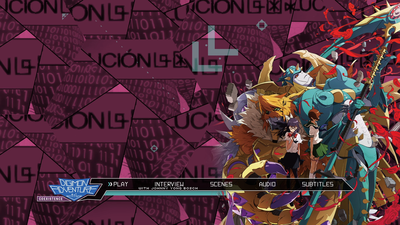 While the overall layout looks nice as I mentioned, I'm not a fan of the images used for both Digimon. Neither looks quite right to me. No physical extras, except the digital copy slip. The code has been blanked out. It's a basic redemption information sheet that gives you instructions that are very clear. The back of the redemption sheet is a simple ad for the prior 4 tri. releases. 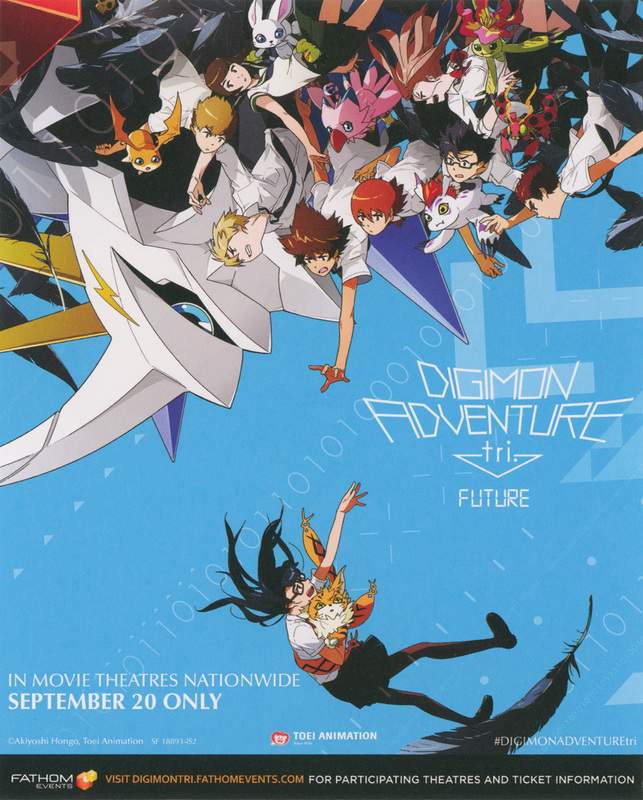 There is also a standalone ad insert for the upcoming theatrical premiere of Digimon Adventure tri. Part 6 - Future. The inserts cover up one disc when inserted into the case. 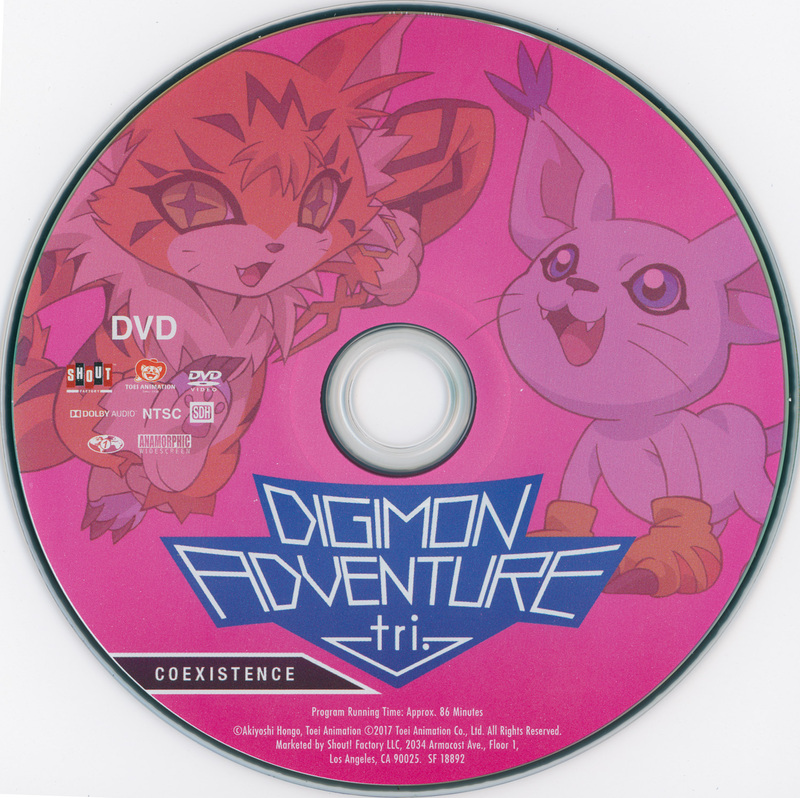 And that's it for the physical... onto the disc contents itself! The video is encoded using AVC at an average bitrate of roughly 27 Mbps. 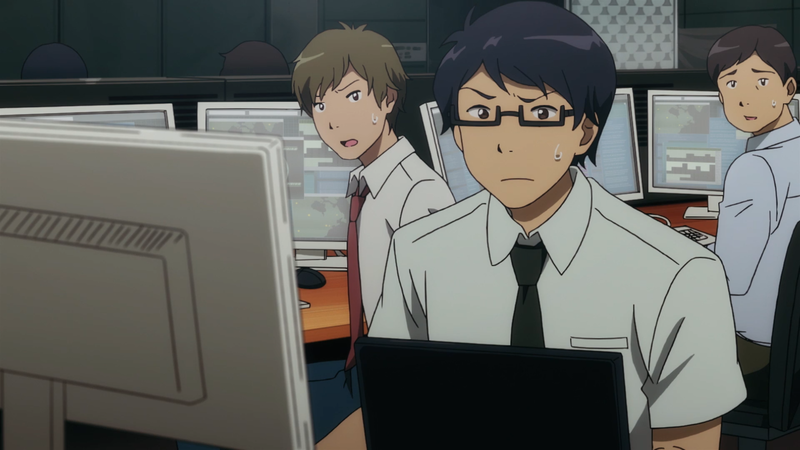 Good bitrate for animated content. tri. Part 5 is encoded at 1080p and 24 frames per second. 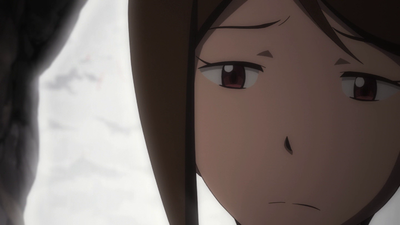 The bitrate is higher than the Japanese release, and is more than enough for this type of content. tri. on Blu-ray looks great, which has been consistent for nearly every tri. Blu-ray. The video quality itself is roughly what we expected. 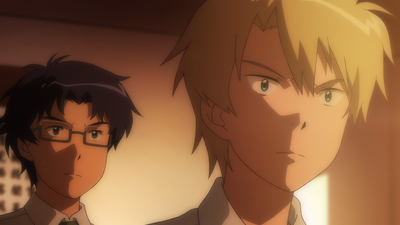 Everything is digital animation, so it looks great. You occasionally get a background or some other detail that isn't aliased that well, but that's par for the course for animated content. 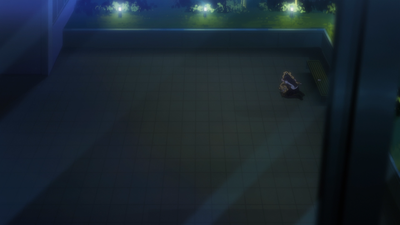 One thing to note is dark scenes look quite good. On occasion you will see some very mild banding but it doesn't seem to be to much of an issue. 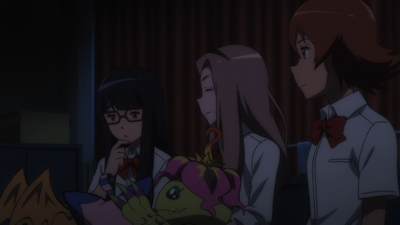 There are slightly off frames if you pick and choose, and the occasional stilted bit of animation, which is normal in animation when you pick and choose what to show, but the encode on the Blu-ray itself is relatively pristine. The English audio is a 5.1 lossless DTS-HD Master Audio track. Good lossless 24-bit audio. 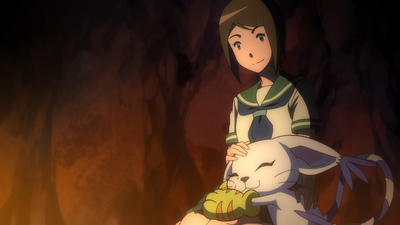 The Japanese audio is a 5.1 lossless DTS-HD Master Audio track, also 24-bit. The audio quality overall is, to my memory, roughly equivalent to what the Japanese release had. The DVD included here should be the same as the standalone DVD release. Video is encoded using MPEG-2 at an average bitrate of 8.5Mbps. This is quite a bit higher than we often see for anime content on a DVD, and is nearing the tip top of what a DVD can do (this is identical to prior tri. DVDs in the US.) It's encoded at 480p and properly shows as '24fps film' content. The audio is roughly equivalent also. The English track is a 5.1 Dolby track at 448k, while the Japanese is 5.1 Dolby at 448k. Relatively standard and expected, and about as good as you'd expect audio to be on a DVD. It feels like the audio on the DVD is missing a bit of punch compared to the Blu-ray, but there isn't much surprise there. It's roughly the same as listening to an MP3 versus a FLAC or WAV. Some people will notice, others wont, and even the DVD is pretty good. 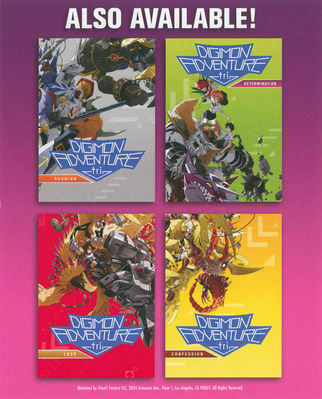 Oddly, the DVD has a fourth track, which appears to be identical to the English subtitles for the Japanese audio track. This has happened before and doesn't seem to cause any issues. I neither had the time nor the inclination to go through the caption track line by line as I did for Part 2. There may be small issues here or there. The subs for the Japanese track seem generally good. I didn't compare them in depth with the CR subs. There may be mistakes somewhere, but on casual viewing I didn't particularly notice anything. I will say, and this has happened for a few releases now, the subtitles are to high for my liking. It isn't technically an issue, but they really are to high in the picture. The Blu-ray menu is rather nice and functionally identical to prior releases. It plays the new English theme while various Part 5 clips run. 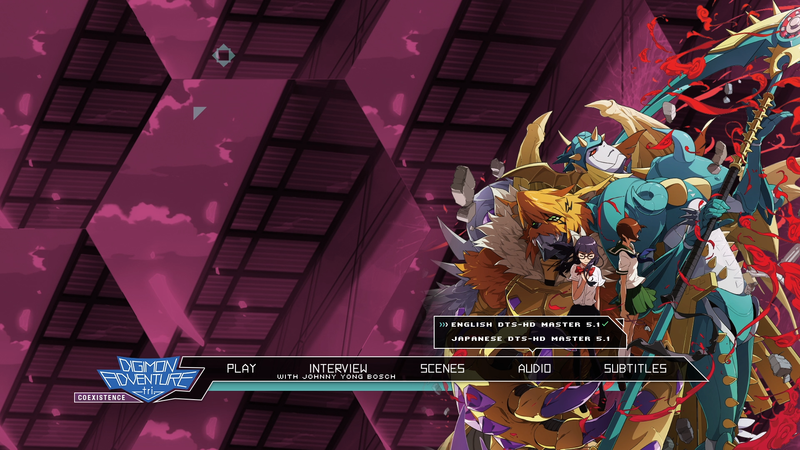 Overall it matches the 'upgraded' menu style from Part 4. The poster key art appears, and the video plays with some different filters on it, leading to an overall nicer look than previous menus. They've also dumped the pixelated font in favor of something that has more the appearance of flat pipes or tubes. Due to having only one extra, they skip giving extras a submenu and just place it on the main menu, which I rather like. Less pressing buttons to get to content. The DVD menu does it's best to emulate the setup of the Blu-ray menu, and does it reasonably well. Each submenu has it's own menu page on the DVD. 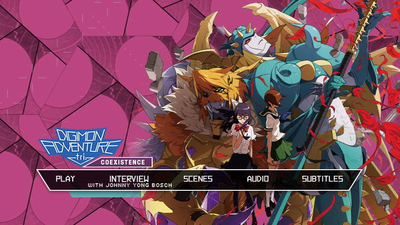 Like Part 4, menu assets have been tweaked here to work better with the lower resolution provided by DVD. While not a major change, those who use DVDs instead of Blu-rays will no doubt appreciate menus that are slightly easier to read. Time for extras! Well... extra. 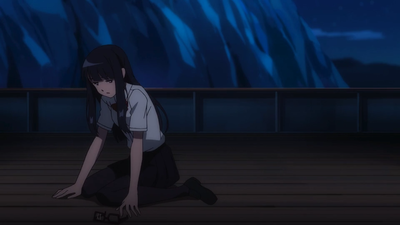 No clean OP or ED material, but we do get a single extra. We get the interview with Johnny Yong Bosch that aired after Part 5 in theaters. It's a rather nice, roughly 10 minute long, extra that is a rather good EPK style interview. Arguably it's biggest flaw is that it seems to have little to do with tri. Part 5. Watching the interview you have to wonder if it was filmed to be included with tri. Part 3, but held back for later after they did the AX panel recording last year. Johnny is pretty honest in the interview about how he didn't know much about Digimon when he signed on for it, and the interview covers a number of elements including his thoughts on TK, his style and thoughts on dubbing anime, and even early interactions with fans regarding tri. 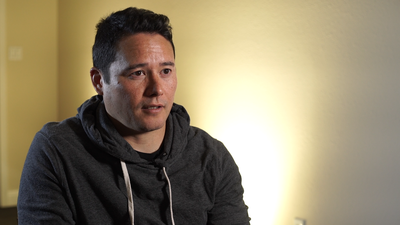 Overall it feels like a much more focused interview than we saw in early interviews, and while somewhat short, it feels like it adds quite a bit to the package. 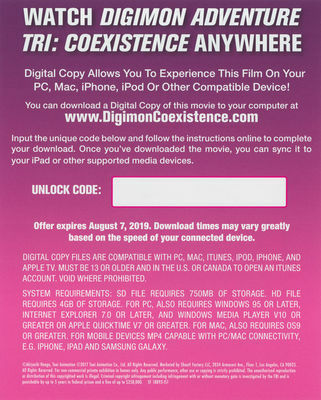 When you buy the Blu-ray, you get a voucher code for a digital copy of Part 5. 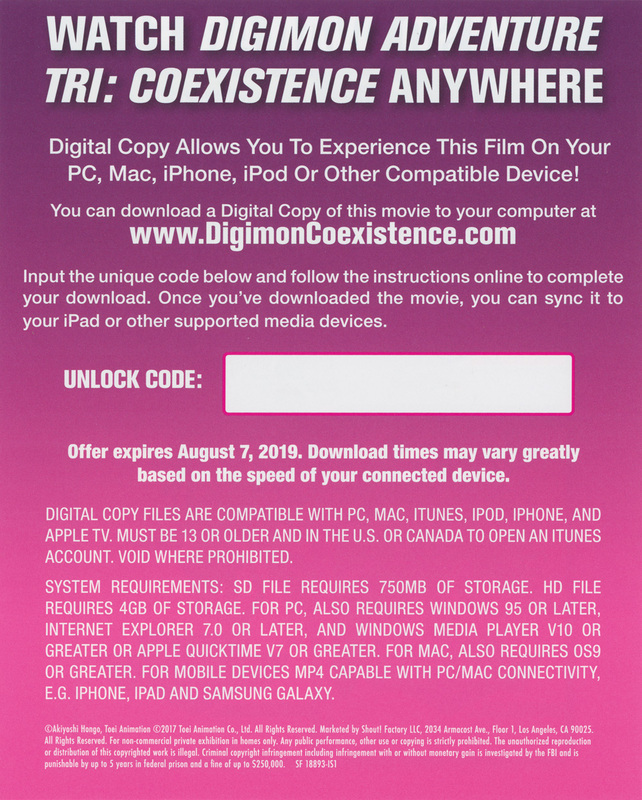 This is a DRM-Free downloading & streaming code that redeems via VHX. This is effectively the Cadillac of digital copies. You receive a copy that you can stream on your devices using the various VHX apps, to say nothing of the DRM-Free download itself. The download copy itself is made up of half a dozen different MP4 files of varying specifications, which you can choose and download at will. And because they are DRM-Free, you can make use of it the best way for you. It's worth mentioning most of the VHX streaming apps also allow you to download specific versions to your devices, but may not include the full range of resolutions that the web interface does. Below are quick video and audio specifications for each DRM-Free downloadable files, along with a single screencap for each.. 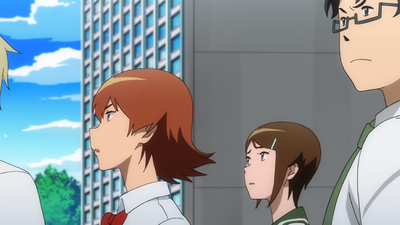 The digital copy itself is dub only, with a downloadable SRT for closed captioning. The files are all rather standard, even if a few of the smaller ones continue to seem a bit hilarious. Although I continue to think they need to add the sign/song track as a second SRT. 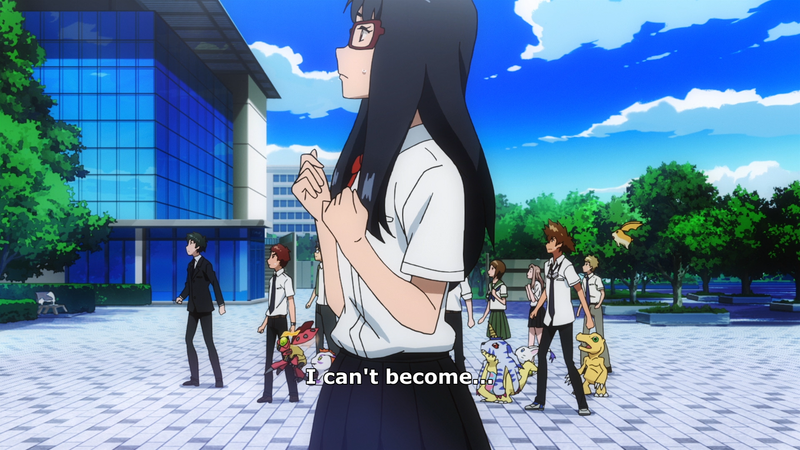 Digimon Adventure tri. 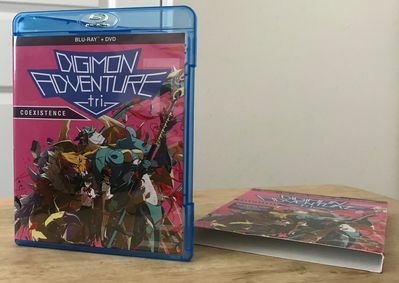 Part 5 has received a very good release in the USA on Blu-ray. In general everything feels about in line with prior releases. Which leaves me with not much to say. It's by and large a good release, and that applies to the DVD also. Minus digging into the subtitle tracks and potentially finding an issue, it's hard to come away with much negative to say. There isn't currently a release scheduled for Part 6, but both based on prior releases (along with information given out early from Manga UK) leaves a December release a near certainty. Screencaps were taken largely at random while jumping around the various versions included with the Blu-ray (although if I knew a moment was coming up I wanted a cap of, I'd wait.) 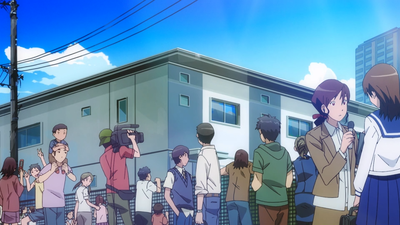 Owing to the unique way DVDs are encoded, the DVD screencaps have been stretched lengthwise to the proper aspect ratio, as they would appear while actual watching. 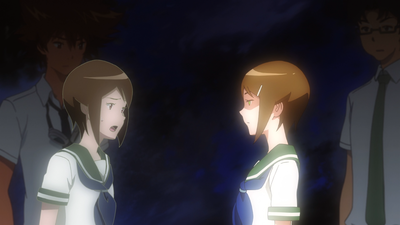 The Blu-ray screencaps are all straight off the disc. The screen captures include numerous screen captures from the Blu-ray and DVD, including various menu captures. The digital includes a handful of shots from each available resolution. The scans can also be found in the gallery, along with a few additional photos of the packaging. The scans are very small compared to the master scans I did (the work and backup folder structure for the scans and screencaps is roughly 7.5 gigs.) I will try and make wallpapers if people are interested. 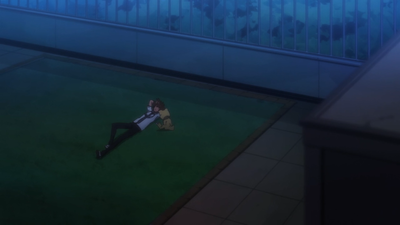 If you want to see a specific screencap of something give me a rough timecode if you can. If you have any questions about the release feel free to ask. If you want to discuss the home video release and English dub of Digimon Adventure tri. Part 5 in more detail we have a thread here. 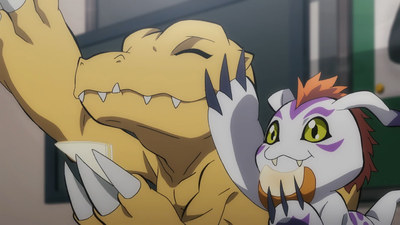 Digimon Adventure tri. Part 5 will be out shortly in the UK. At the time of posting no release has been announced for Australia yet. "A small moment is the Mysterious Man in his guise of the Emperor having a voice that isn't Jeff Nimoy. Whether this was done on purpose, or a misunderstanding of who the character is, I'm not sure (in the scene we only see him from behind, etc.)" 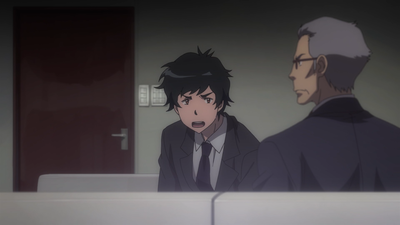 I figured they got Derek Stephen Prince to voice Gennai in his disguise form. I know he's been asking after Ken coming back and keen to get involved. So that's my theory. 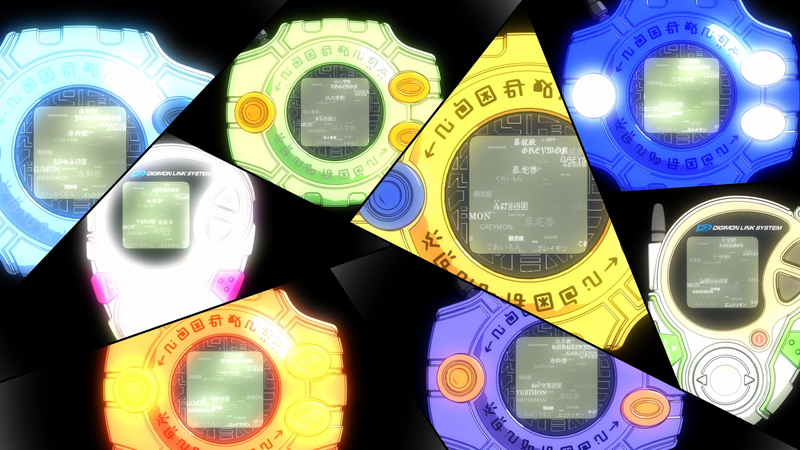 Listening to Tai's speech, I did notice a couple of lines that had a distinct difference in audio quality, where he says something along the lines of "I'll call off Omnimon. 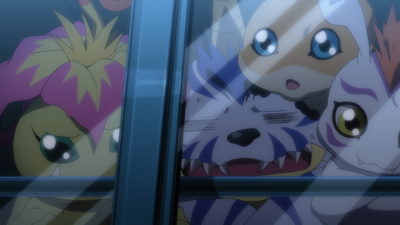 Even if he's not strong enough to beat Meicoomon, Jesmon will do it for us." 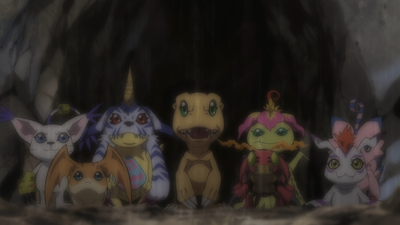 I recall the problem as you described it before was that they said something about "tricking Jesmon into attacking Meicoomon". I loved the bit they added about Joe going to prison!